I've finished converting the meargh's staff. I left the arrangement pretty much as it was, but I moved it down a little so it wouldn't look top heavy, and added the parchment wrapping around the branches. This will have ogham script running along it eventually. 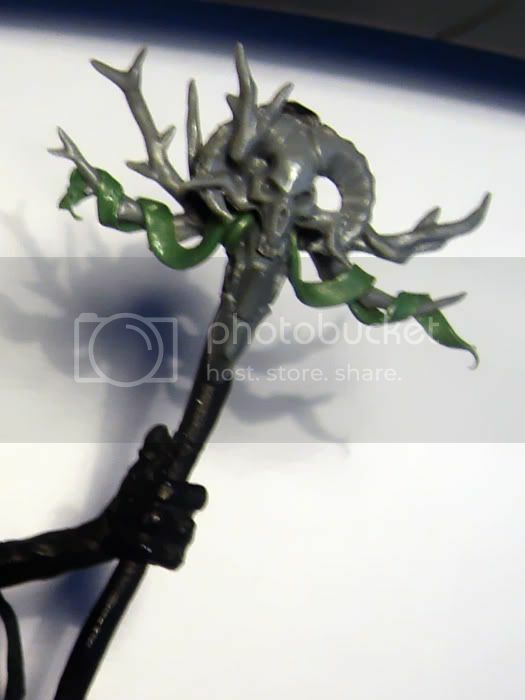 A little greenstuff to blend the branches into the staff, and it's ready to paint. As to the owl, well, after some musing I decided to leave it out. Both dirach will have familiars, so I thought it might be a bit much to have both the dirach and the meargh with them. 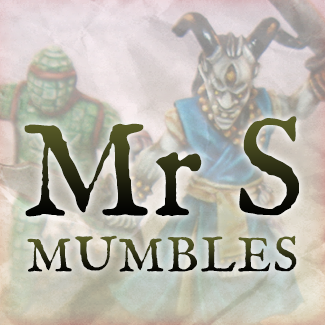 I do like my warhammer podcasts. 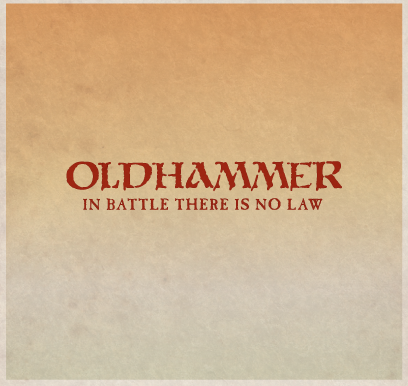 I listen to a fair few, GarageHammer, Bad Dice, Heelanhammer, Painting Tabled and one or two others. 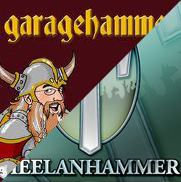 When you listen to a podcast for a while, you get invested in the people presenting, so it's a bit of a sad day that Chris Barnette of Garagehammer has decided to leave the podcast, and Dan Heelan and Wayne Kemp are closing up shop at Heelanhamer. I'm sorry to see them go, Chris and Dave of Garagehammer were a great duo, as were Wayne and Dan of Heelanhammer. Dave is still soldiering on with Garagehammer, and I wish him well, Ben Curry went on from strength to strength after Ben Johnson left, so hopefully Dave will do the same. 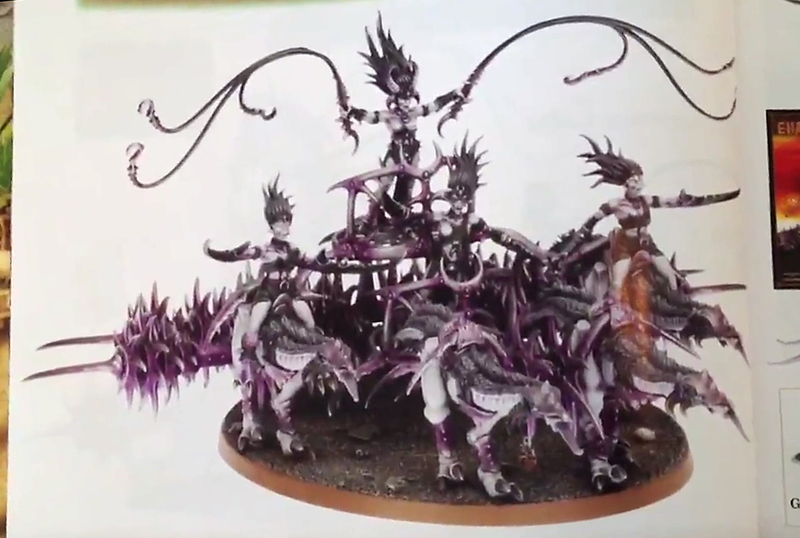 Well, looks like the rumours of warriors of chaos getting a new book in August were off the ball, or perhaps a victim of the GW release shuffle that's been going on. 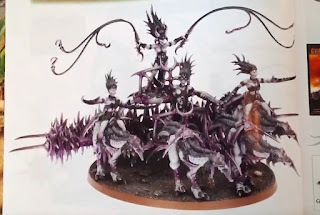 Instead, a new host of daemons greet us, with new plaguebearers, nurglings, blue scribes, flamers and a big Slaaneshi chariot. The nurglings in particular look great. 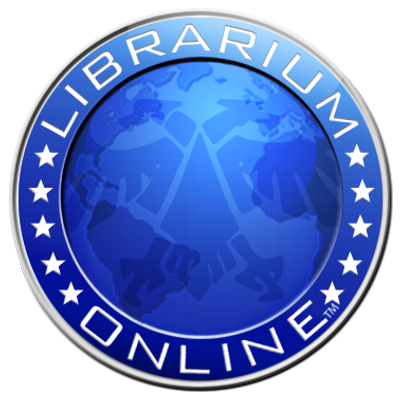 One hears a pamphlet will be released to update both the daemon army book and codex, exciting news for daemon players. Here's a video on the new update. The images below are via Dice and Brush. Fimir - First Fimm Unit DONE! Big day here at the mumblings. Finally, and I mean finally, I have the first fimm warrior unit done! It's a big deal for me, as this army was a long time rumbling around my head before I even started, so looking at a finished unit now is pretty satisfying. The Súile na Lisaart are table ready at last, which let's me work on a character as a little reward, so it's back to converting the meargh's staff. 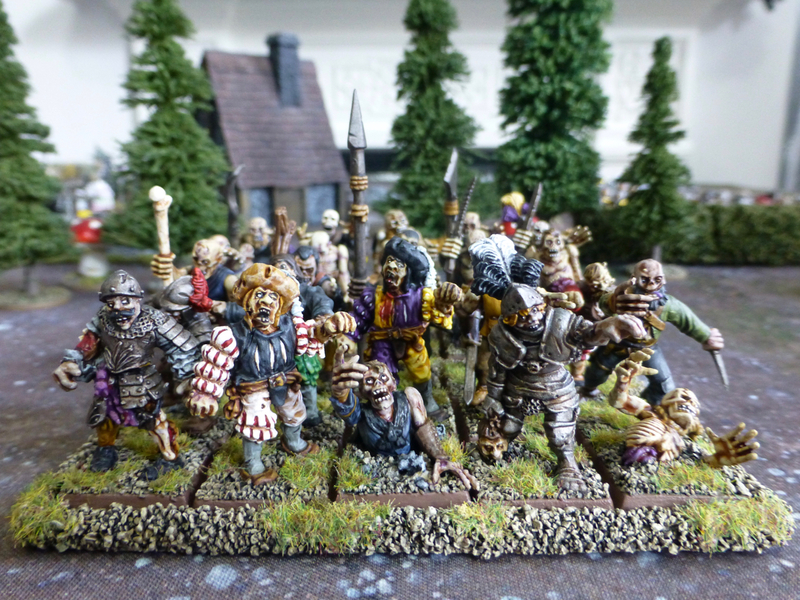 Here's some shots of the final four fimm, and a group shot of the whole unit. I've been rifling through the bits box looking for some accessories for the meargh. 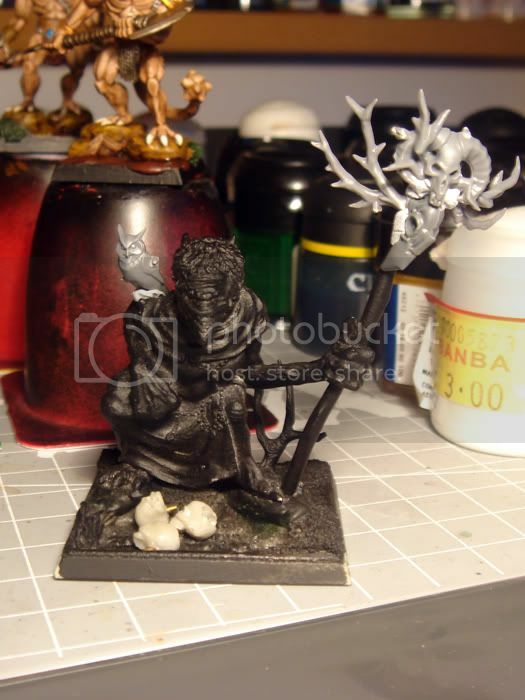 I ended up with some bits to spruce up the meargh's rather plain bone staff, which you can see mocked up here. It's not fixed in place yet, as I'm wondering what you, dear reader, think of the bones and branches arrangement I've got going on. 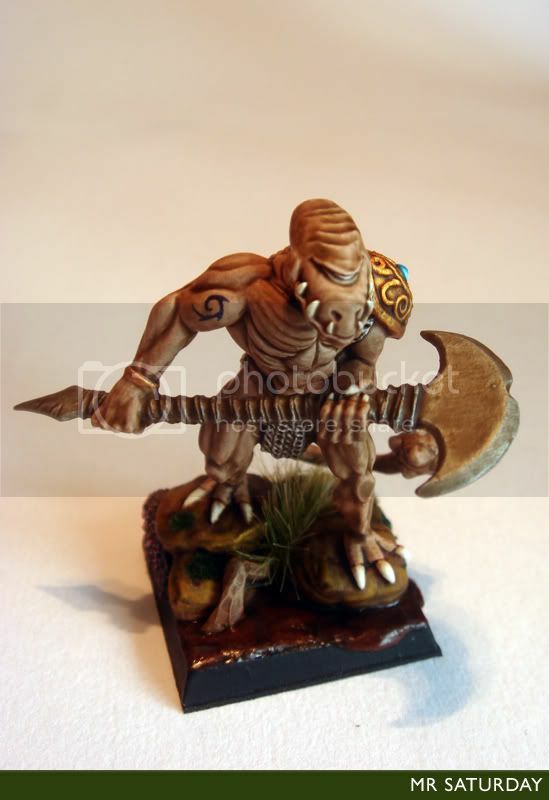 If I go with this, I'll probably paint wood grain on the staff to make it wood rather than bone. There's always been a few individuals who still enjoy a bit of early edition Warhammer. 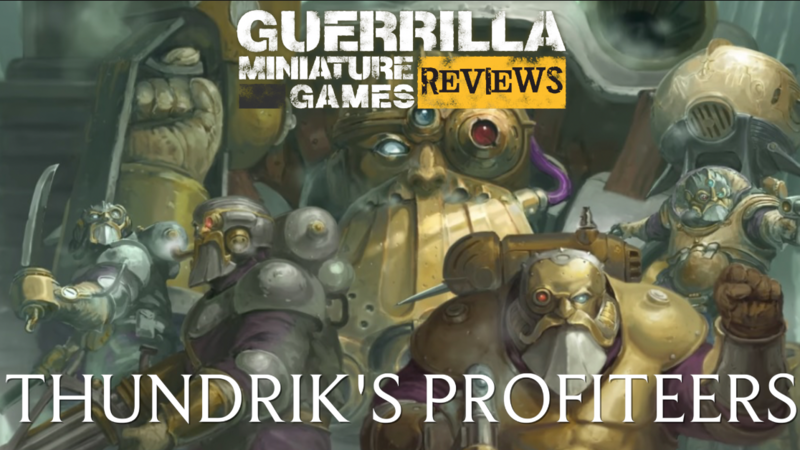 (3rd ed for me please) Lately this has been picking up a bit of steam, thanks in great part to the Realm of Zhu and Oldhammer. 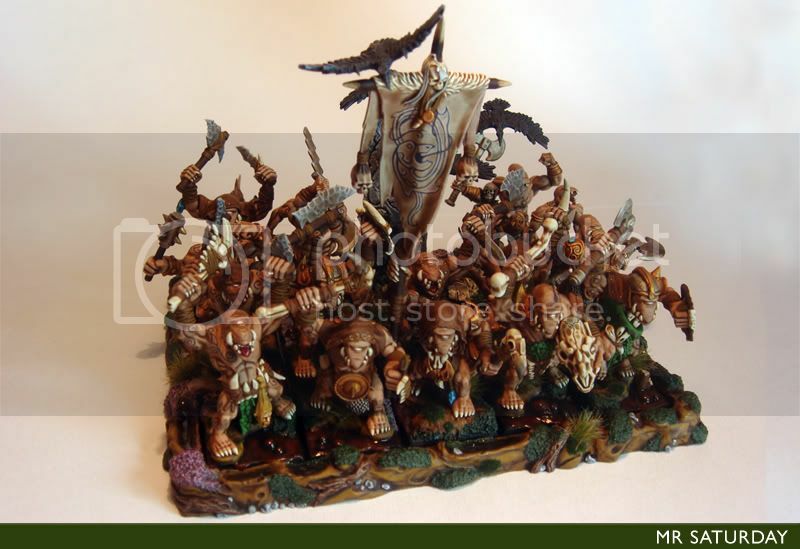 I have a lot of fond memories of this period, and I love the miniatures from around the time of 3rd edition Warhammer (I have the entire undead catalogue, for example). 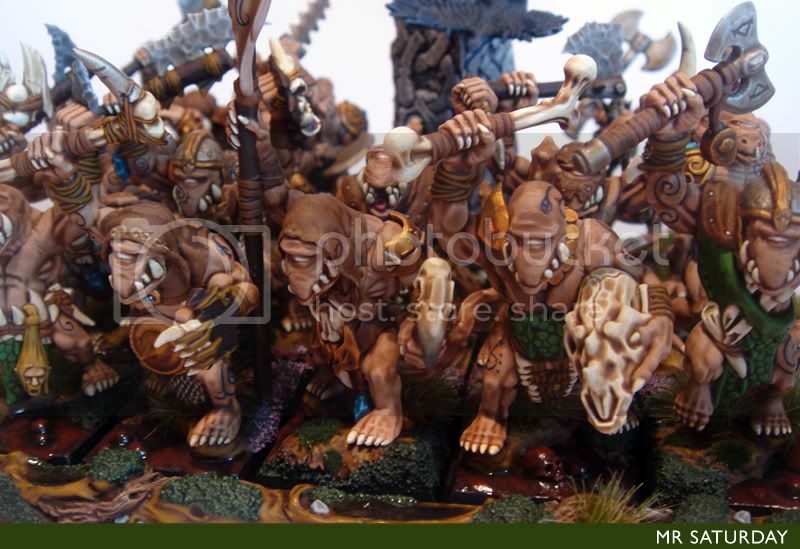 I'm sure a great deal of you young bucks were either infants or non-existent when I started down the gore-soaked road of warhammer, (pat pat) but for those who were there, or simply those interested in the days of yore, take a gander. You can even get t-shirts. 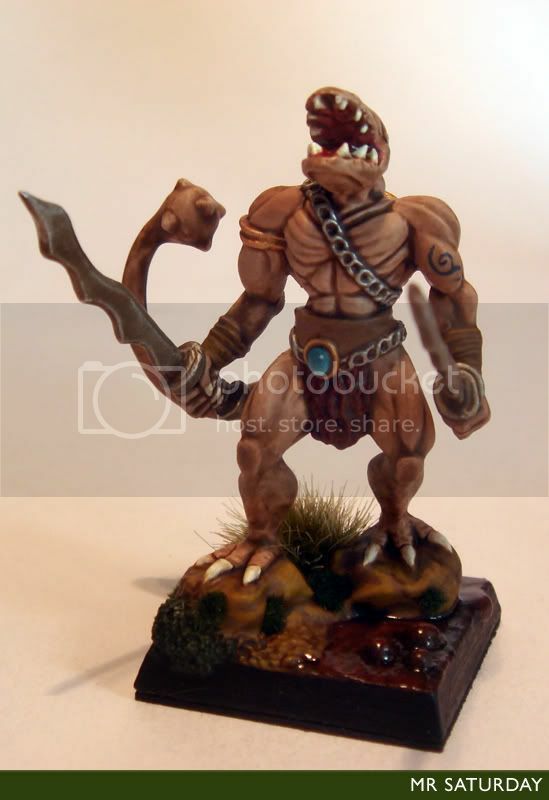 I've been thinking about a new unit for the fimir for a while now, a kind of infantry version of the fenbeast, perhaps to represent chosen (I'm using the Warriors of Chaos list) and I've come up with the half-dead, taken from an old story from 2000AD's Slaine. I think a combination of skeleton, Mantic zombie and wood elf dryad parts will do the job nicely to represent the distorted sludgy horrors I'd like to create. 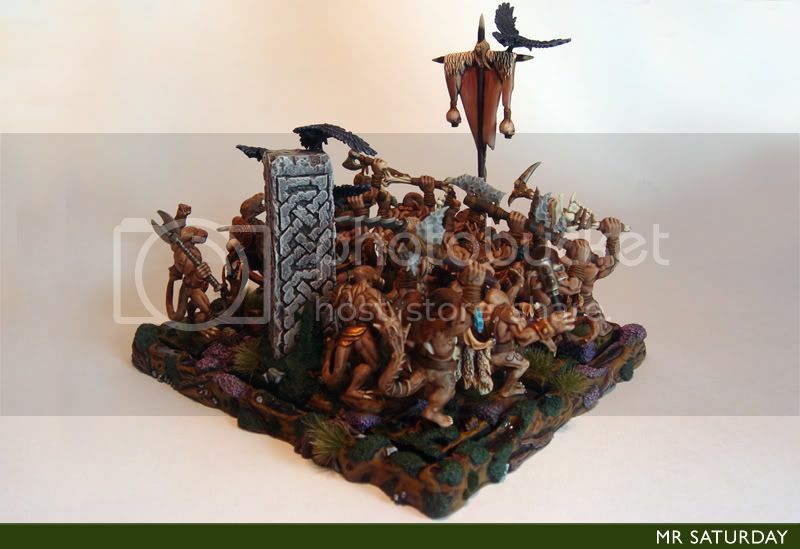 I got the weirdstone idea from Slaine too. Here's my fluff for the unit. These terrible creatures are the leathery remains of those sacrificed to Fimul by the meargh and dirach of the clan over the centuries. They are given the semblance of life by a shard of Leystone, which is jammed into the throat of the sacrifice once it is cut. The leystone, or weirdstone as some call it, slowly pulls magical power from the depths of the fen the body lies in, often re-shaping muscle from rock, root or mud until the half-dead is ready to emerge, sometimes months, or even years later. The natural preservative in the bog gives the creatures a leathery, distorted appearance, all the more awful because of the blue glow spilling from their eyes and mouth. 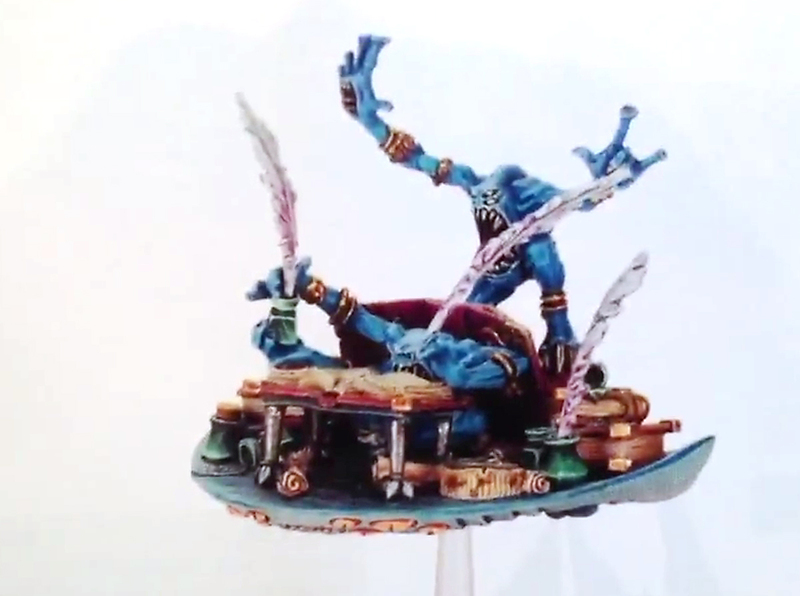 Recently I came across Clam's (of Clamshells & Seahorses) new blog, Ewal Dvergar, dedicated to a custom range of chaos dwarves, sculpted by John Pickford. Clam is a regular on the most splendid Chaos Dwarves Online. 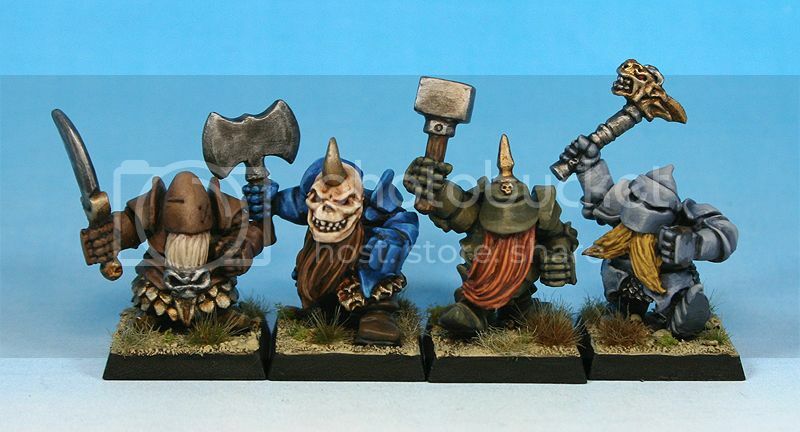 These dwarves reminded me heavily of the Marauder miniatures MM90 range from back in the day, which I adore. The core troops are multi-part too, which means lots of conversion potential. There was also a hero model as well as some rather nice grenadiers sculpted by Clam himself. I thought wow, that's a great idea, and those dwarves look amazing. I'd love me some of them, but they weren't for sale. Boo. Then Clam threw up a post called Want Some? and well, I was emailing the fellow within seconds. This morning a package arrived, and I can verify these are some super tasty evil dwarves, and will match my own army perfectly. I remember the time getting your hands on some chaos dwarves was quite a feat. Thankfully, those days are gone. 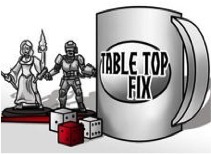 I spotted this little teaser on elfordminis yesterday. From what I can see, I like, though I'm not 100% on the horned heads. It's hard to tell how big they are, those do look like 50x75 bases, which would make them pretty huge. I was sure they were going to be 40x40 lads, and this makes me re-evaluate my intention to build my own. 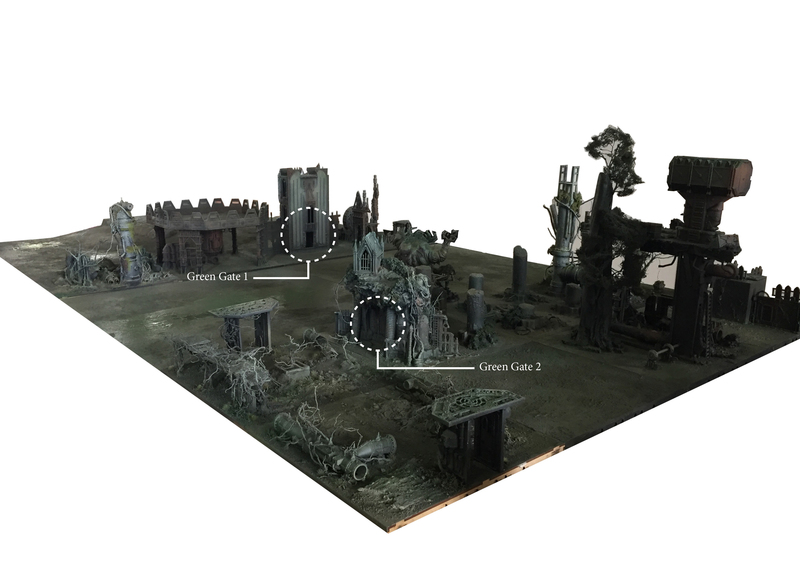 In other news, Mantic have released a box of 10(!) abyssal dwarf halfbreeds for £19.99, which is hard to ignore. They might not be as pretty as the FW ones, but the price is crazy good. 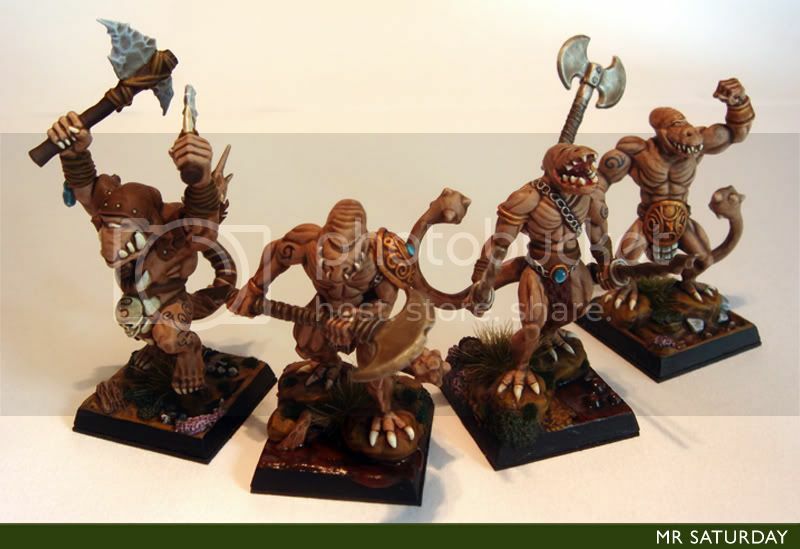 I might get these and a box of the Avatar's of War dwarf berserkers and see what I can come up with. 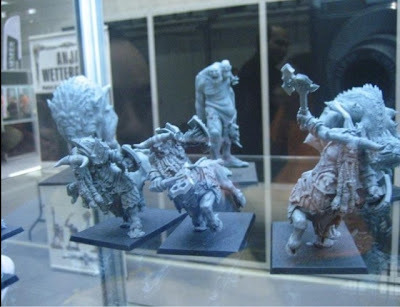 I may pick on an FW one for the taur'ruk though, I'll have to see how the scale compare.